iTRIZ - Elena Averboukh innovation-24 Innovation Center LUSI Ltd.
We use Agile methodology and customize each service, project and course Design to meet your specific objectives and needs. Get ready to attain or renew your Innovation Problem Solving skills, as well as Process Lean, Continuous Improvement, Operational Excellence and Six Sigma competency. 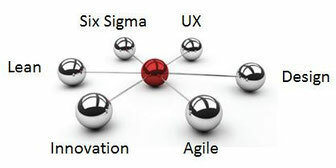 Learn Agile Business Process-, User Experience (UX) and Big Data Predictive Analytics and advanced Project Management. All-day hands-on Training Modules teach practical skills and result in recommendations that you can apply immediately. Empower your team with Learning-through- Action consulting projects. Just-in-time understand your Customers, Suppliers and Employees, Improve Reliability and Customer Support, by professional and Agile Big Data Predictive Analytics management. Build practical skills and implement projects on Innovation, Lean Six Sigma, Scrum, Quality Assurance, Design Thinking, Big Data Analytics, as well as User Experience (UX) best practices lead by Master Instructor and Coach Prof. Dr.-habil. Elena Averboukh. Transform your Process Performance with our Project-, Quality-, Innovation Management and Big Data & Predictive Analytics consultancy. Bring your questions to these fully interactive sessions with your Expert Coach. Each @Coach session is limited to a small group of participants, which allows for team facilitation, process mapping and interactions around specific topics on the interactive whiteboards. We analyse professionally big data sets and provide you with a valuable insight in your Customer's preferences, significant factors driving your performance and stability etc.